The world-renowned Bleuler rotary vibration mill is ideal for intensive grinding and mixing of laboratory samples of practically any fracturable material. The unit is the epitome of quality design and constructed for ease of handling, outstanding sample preparation speed, and a long life of minimal maintenance operation. Originally designed for the stringent, reproducible, uniform grinding specifications required for spectrochemical, X-ray fluorescence and radiometric analyses, this unit has universal application for many industries. High, 900 RPM motor speed. 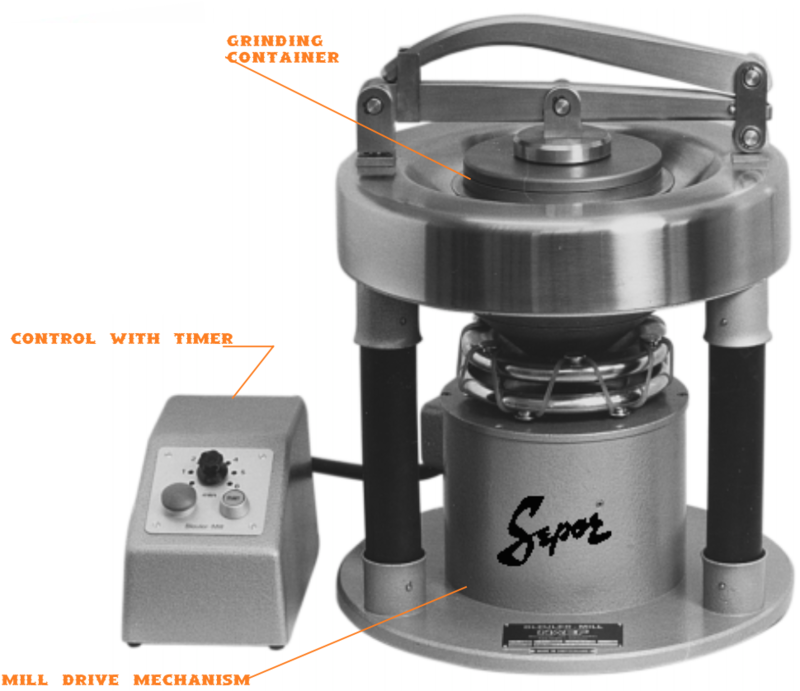 The grinding containers, in a variety of compositions, incorporate an anvil ring and puck to pulverize the sample by an eccentric vibratory action. The one-piece stainless steel mounting cone is equipped with a quick-clamp handle to accommodate the grinding container. Effective vibration damping or motor overload is provided by the proprietary rubber columns and elastic coupling. Simple, safe and durable construction are attributes of this bench top mill. The control includes a timer which may be set from 1-6 minutes, ample time to grind any material in the Bleuler Mill. A) The standard 100 ml and 50 ml container sets are very hard, abrasion resistant chrome-steel alloy with a proprietary 70 RC hardness and are the most widely used and least expensive. Most other fabricators of similar type metal abrasion applications can achieve only 57 to 63 RC. B) Tungsten carbide alloy containing 9% cobalt is the hardest composition available. This hard material extends the container life, is extremely abrasion resistant with virtually no contamination when grinding the hardest samples. PRECISE, reproducible grinding times are provided by an automatic timer that stops at any selected period up to six minutes. The three phase and single phase 220V/230V models are recommended for heavy duty, continuous operation. The 110V/1 Ph models require a cooling off period between grinds. The -066 model has a 230V/60 Hz/1 Ph input converter and electronic timer control interfaced with a 230V/60 Hz/3 Ph drive.